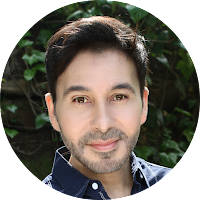 Mark Montano: Fiskars Friday! Don't miss your chance! 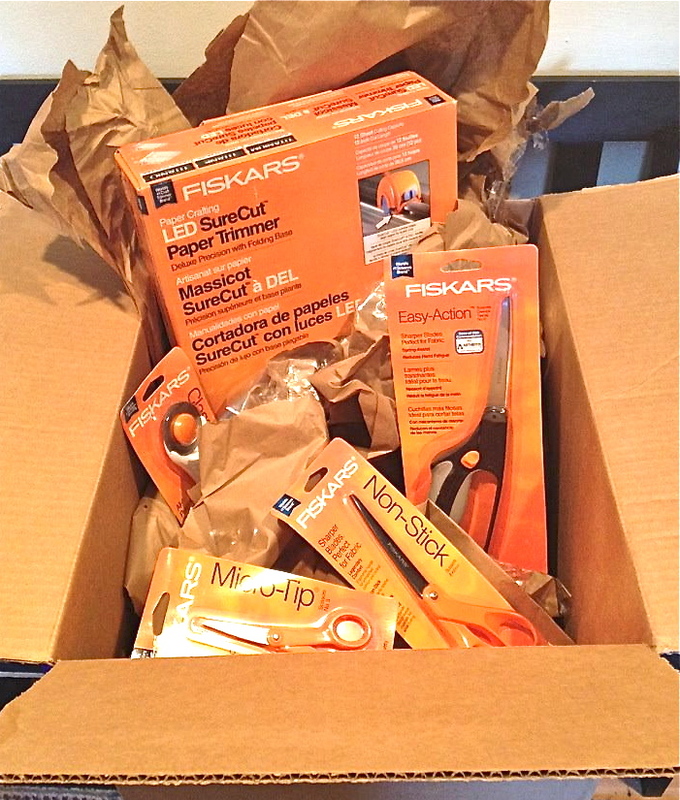 Today is our 11th official Fiskars Friday and WOW are we giving away some amazing prizes! Pay special attention to the rules and make sure to enter because as you already know, FISKARS has incredible cutting tools and they might just end up in YOUR craft room! 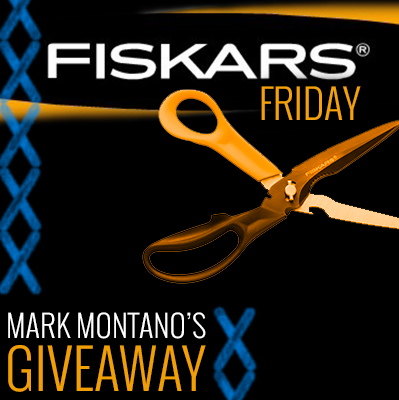 This contest is bi-monthly so look for our FISKARS FRIDAY banner and make sure to enter. 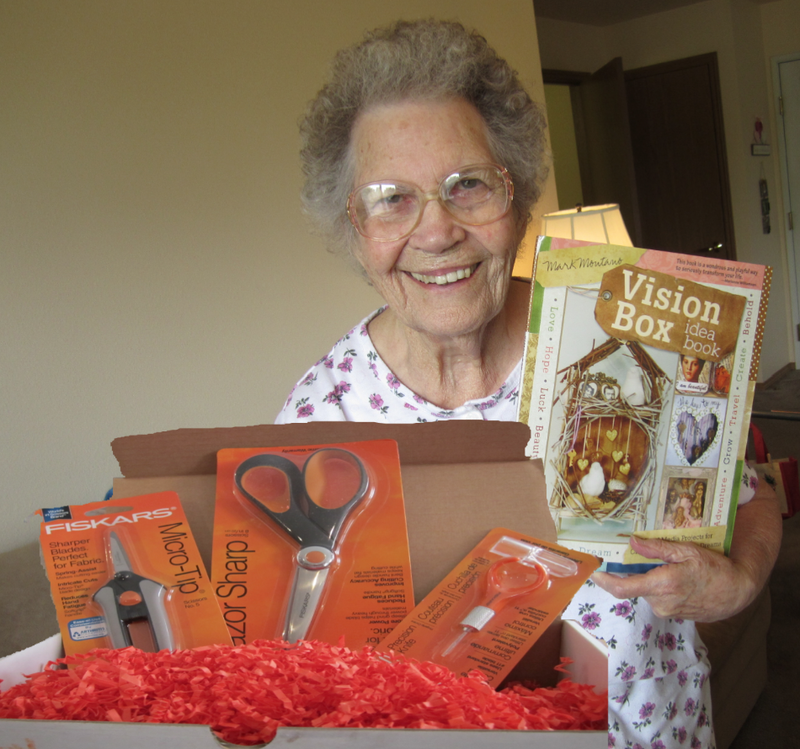 This is Sandra Strait's 89 year old mother posing with SOME of her prize package. Apparently Sandra's mom decided it was hers! I've already liked the fiskars fb page, and commented. I LOVE Fiskars!! Ok, I had no idea they had the Fuse system, that looks awesome! I really had a hard time choosing a favorite, I love the mint hand drill , and the gel pens. They make so many great products! Already a subscriber to your great videos. Love the tie belt! And of course, you chose some great colored ties. Thanks for all the great giveaways, and creative tips! So far, my favorite tool is the 8" craft scissors. I commented on your newest video as dahbou. 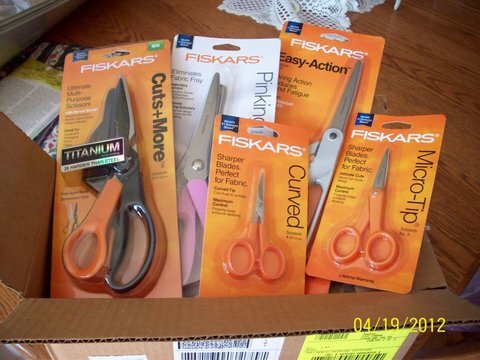 WOW Mark it's so hard to pick what FISKARS I Like. But I love there PUNCHES AND PAPER TRIMMERS AND CUTTING MAT,CRAFT SCISSARS, CRAFT KNIVES, EMBOSSING AND ALL DIFFRENT CRAFT TOOLS. I'M SURE IF YOU PICK IT OUT FOR ME I WILL LOVE ANYTHING. THANKS MARK FOR EVERYTHING YOU DO FOR US. HAVE A GREAT FRIDAY!!!! I need this giveaway sooooo bad!!! Love my FISKARS!!!! Already a fan of fiskars on FB! Left a message. Favorite fiskars tool other than all the scissors are their punches. Already a subscriber of your Utube. watched and commented on video. Patience. Use the force. Think! Fans of Fiskers on FB. I follow you on subscribe to you on Youtube. I forgot to say that Fiskars Pinking Shears would be an amazing addition to my crafty space!!! Yay, Happy Fiskars Friday!! Liked and commented on everything =D My fave Fiskars tools are Punches and paper trimmers!! Done, done, done done done!! My favorite fiskars tool is the big trimmer with the wire guide. My guide has a couple kinks in it, but it works awesome! Recommend it to everyone!! Hello Mark, I did everthing you asked. 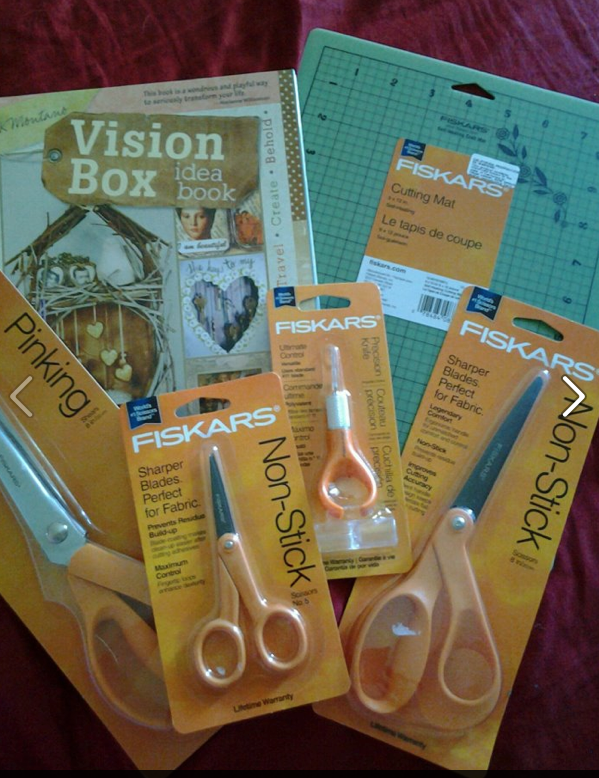 I love Fiskars products...I think I would either like a paper trimmer or a craft drill. Happy Fiskars Friday everyone! Howdy King Possum...just dropping in to say I have shared,liked,viewed and commented. Now where are my scissors? :P J/k Have a great day!!! Good luck to everyone! I did everything listed! Thanks for the awesome chance. I love Fiskars! My trimmer is my favorite Fiskars tool! I have two favorites. My rotary cutter and my rag quilt clippers. I love my circle punch but can sure use some scissors. I don't have any good ones. Pinking shears and rotary cutters are my favorite and what I def use the most! Good pinking sheers and embroidery scissors make all the difference! Already follow you on Youtube!!! YAY!!! I subscribe to your You Tube Pages as c8ergirl. I love the LED Sure cut trimmer...sure could use a new trimmer. I love all of Fiskars tools. Especially the new fuse and all of the punches. Happy Fiskars Friday!! Already have like Fiskars FB page for a while. Still said you sent me and I said HI!!! I have to say that I LOVE my pinking shears. I have three daughters who are constantly trying to get into my scissors, and I guard them with my LIFE!! I have to say that my pinking shears are my favorite. I have three daughters who are constantly trying to get into my scissors, and I guard them with my LIFE!! I need something to do rag quilts, can you say ouchie mama from using plain old scissors! I could use anything though, no pressure! I SO need new Fiskars PINKING SHEARS! PLEASE! Happy Fiskars Friday! I need something to do rag quilts with. I tried using plain old scissors -ouchie mama! I would love anything, no pressure! I love Fiskars! I'm really crushing on the extra large circle squeeze punch! I love all Fiskars products! I'm really crushing on the Large CIrcle squeeze punch! Rotary cutters and fabric scissors are my fave's! Rotary cutters are my most used tool with fabric sheers being second!!! 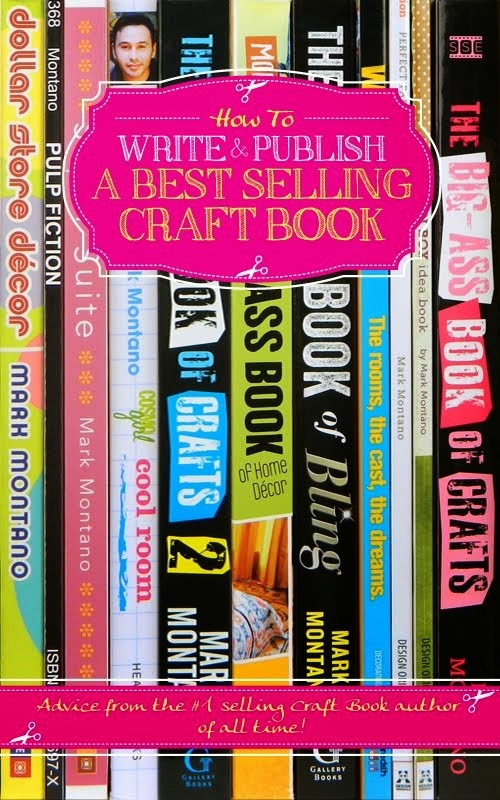 Love your craft blog! Done as requested...would love some crafting knives or sewing tools. I've never had a chance to use them before but I think it would be pretty awesome! I think favorite of the Fiskars tools would have to be the fingertip knives. I would love to own one or two. 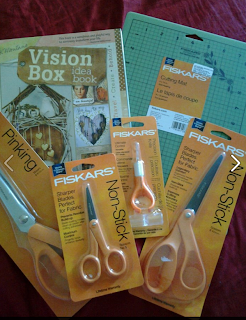 LOVE all the fiskars stuff! Love the cutting tools! I liked and commented and shared the fiskar's FB page. and commented on the youtube video! My Fiskars Pinking shears were "adopted". I need a new pair! Omg so many faves, how to choose! Rotary cutters and mats, paper cutters, punches, sewing stuff, oh and of course just plain ole scissors!! Fiskars rotary cutters are great! But then again all their products are great! The Fiskars rotary cutter is great! But all Fiskars products are great! Done! :D I'm a punch gal myself!! I would love to try the Fiskars rotary cutter. But I'm a simple gal and 9" dressmaker shears would suit me just swell! I really need a good pair of scissors for cutting material. Since I'm not an expert dressmaker, I would be happy to have a pair of the All Purpose Fashion Scissors! That would be a favorite for me! Anyway - Shared on FB, and commented on the Fiskars page. What a great contest. I recently lost my pinking shears and would love some new ones. The pink one looks great! Commented on the Youtube video (and long since subscribed) as "dubbage42". I have Fiskars products all over my Studio, but the ONE product...the ONE PRODUCT I could not live without, and that I use constantly are my plain old Orange handled scissors. They make a LONG straight cut so much easier. And my 12" "old" grey paper trimmer is even easier for me than the newer model...could just be me. 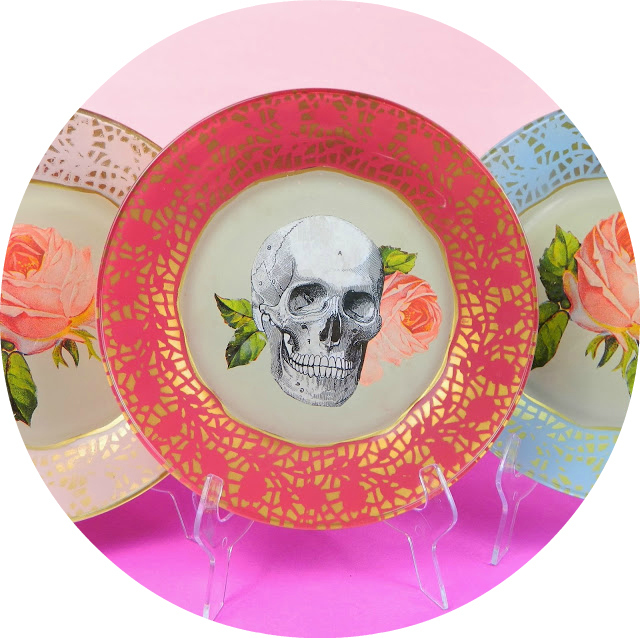 I also think the color ORANGE is brilliant, because you can see them hiding here and there making them easier to find on your cluttlered work table! I LIKE and commented on the Fiskars FB page! I shared on my FB page about the contest. My favorite Fiskars tool is the Desktop Scissors Sharpener. I left a comment on your NEWEST video, I didn't see anything about Fiskars in the description though. I already Like Fiskars on Facebook. I left a comment that you sent me. 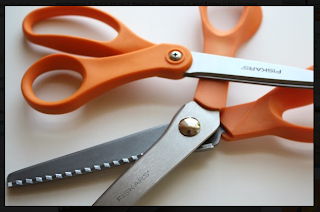 I would Love to try the Fiskars Rotary cutter...and I desperately need a new pair of Pinking Shears. Wow - Mark! This is so awesome. My favorite Fiskars tool are my precision scissors, they are getting a little dull on the tips from all the fussy cutting I do, but I always keep a spare on reserve. Thanks for your awesome inspiration! Done 1-5...good luck everyone and have an awesomely creative weekend! I need a new cutting mat. And a new thread snipper. My favorite tool is my PREMIUM PERSONSONAL PAPER TRIMMER !!! !....Gotta have it wherever I go !!! Thanks....!!! and I have shared and liked !! Happy Fiska Friday!!! I am still wishing for some interchangeable border punches. I Love Fiskars Scissors!!!!! !I even have a fold up pair,so I carry them everywhere! My FAVORITE Fiskars tool is most definitely the Ultra ShapeXpress™ Shape Cutter! Wow a Favorite item .. I love the new fuse system!! but the cutters are a must have!! Wow so many great products!! I would REALLY love this box!!! I can not live with out my fiskars rotary cutters... and my snippers too...oh and my cutting mat...I love all that I own.. some are very old...but hey still working.. These would be awesome in my new studio....when we finish building it! The neck tie belt was just what I needed.. but oh how I love the doll head night light... how fun is that..Thanks Mark. Hi Mark, I have liked Fiskars on FB and my favorite Fiskars tool is the Fingertip Detail Knife. It has more control for me than a X-acto knife. Have a nice Weekend! Yay for Fiskars Fridays. My favorite tool is ummm ALL OF THEM. LOL. Actually I love the trimmers. They hold up well. Mine is finally dying after a lovely 5 years together. Thanks for the chance. I have done all the steps above. I love the love the deluxe craft paper trimmer. It's perfect for all my paper projects! I love all my Fiskars products - have lots of them. I suppose the one that I use the most if one of my trimmers ! Having just cut up several pkgs of 12x12 paper into 6x6 - I would love to have an anvil type trimmer that does multiple sheets easily ! ( or a Fuse would be awesome !) -- Seriously though, I have a thing for scissors too - love the designer handle scissors/rotary cutters and of course I have a crush on all punches! Loev Fiskars Friday. My fave tool is ummmm all of the, LOL. Actually after 5 years together I am having to say bye to my paper trimmer. It was awesome and so would get another one. ps. 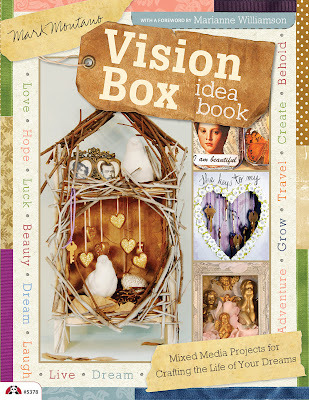 I love that little birdhouse on the front of your book ! My fav is the finger tip exacto knife. I have more control of the blade and have turned other people on to it as well!!! Love my fiskars paper trimmer and my scalloping scissors!! I left a comment on Fiskars FB page! I enjoyed watching your belt video - (and I miss seeing you on tv ) ! I also subscribed to your youtube channel ! Thank you ! oops..also sharing on my FB page! I could use a fingertip detail knife to go along with my fiskar's decorative edgers! I need just about everything. I really do have a bunch of FISKERS LIFTERS in my life! I sure hope I followed the rules! Ooooh, ooooh, ooooh! And some fabric scissors! Pretty please! Have been a fan a Fiskars all my life.... commented on their FB page!!! Shared on my FB page! Happy Fiskars Friday! Been a subscriber early on... LOVE LOVE LOVE the Necktie Obi Belt!!! For my favorite Fiskars tool... if it say Fiskars I LOVE it... everything Fiskars I own I Love. I know I have good quality tools!!! 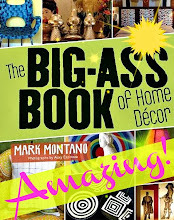 Hi Mark, I found you on YouTube through Threadbanger and love your tutorials. If I could have my pick of Fiskars, I would choose the Dressmaker Shears. GL everyone. Hi Mark, I found you on YouTube through Threadbanger and I love your tutorials. If I could have my pick of Fiskars, I would choose the Dressmaker Shears. GL everyone! I love the decorative edging scissors, and all their gardening tools. I also would love some of their design hole punches! I love the decorative edging scissors, the design hole punches, and their gardening items! All the steps are now completed! Hello Mark, I love everything fiskars but I simply adore the scissors and the finger craft knife. Just love everything about them and loving your vid's there awesome my daughter loved the one on the magic wand. Love fiskars everything, and love your vids.My daughter loves the magic wand one. Posted on Fiskars FB page! 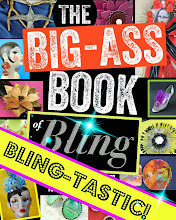 are on my "want" list and my fav' instruments I own...12" Personal paper trimmer and my micro tip scissors. Love em all! I am a true fan and devotee to Mark and everything he does! And I use the Fiskar's punches to cut stickers out of shelf paper to decorate vases and even my cell phone cover! 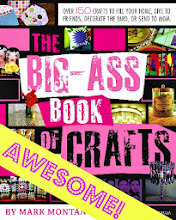 Shared on my FB page about your Fabulous Fiskars Friday - even used your cool new banner!!! I love all my Fiskars tools, especially my scissors and punches!!! I was thrilled to see that there are curved Micro-Tips in the range, so I would love, love, love the chance to win a pair of those. Thanks again for the chance to win such a super cool prize!!! awesome products and awesome customer service from fiskar. I have no one fav. I cant pick one. Though tiny scissors for fussy cutting would be an awesome thing to own! well take two... I hope I dont post twice by mistake. I do not think the first take took. Love fiskar products and their customer service. Love all the products I do own. I would super love to have some scissors to fussy cut with and all the punches in the whole wide word... ha im not greedy. Giggle. My favorite product is my paper trimmer but I need a newer one! I completed all 5 steps. Love all my Fiskars products but my favorite Fiskars Friday product is my paper trimmer. I need a newer one since I've worn mine out! Love all Fiskars products but can't live without Fiskars paper trimmer!! My favorite product is my new Fiskars trimmer! LOVE it!!! Already a fan of Fiskars page but stopped by to say Hi! i love all the fiskars tools!! fiskars friday is the best, i love all fiskars products! I love all my Fiskars tools...that's all I'll buy! I liked their page, your page, posted on my fb and now I'm checking out Youtube!! Am a new subscriber to youtube! Loved your jacket! You are so clever! Commented on your Youtube video! Great jacket project!